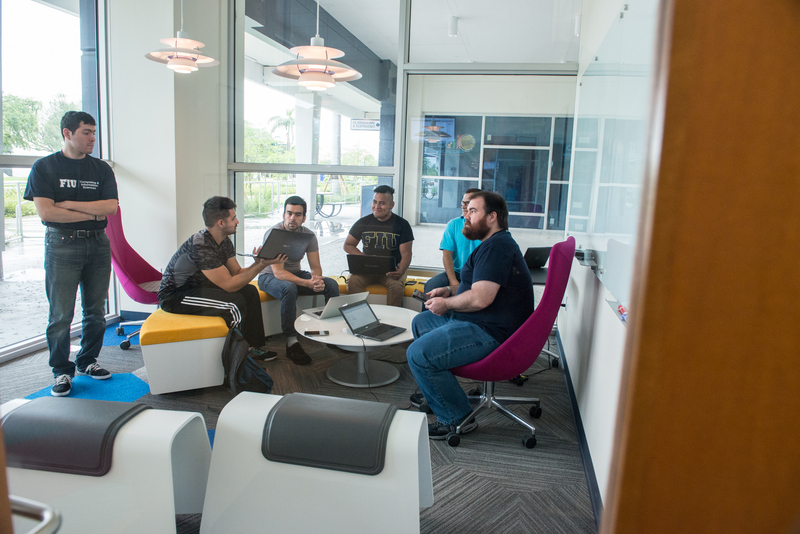 Students in the School of Computing and Information Sciences collaborate on projects at FIU’s Tech Station, which will be home to MangoHacks March 4 to 6. During the first weekend in March, 250 college students will hack day and night to make a new piece of technology that can help make the world a better place, or at least more entertaining. Organizers hope the first student-run hackathon at FIU – MangoHacks – will serve as a creative outlet for students to make apps, forge new friendships and find mentors. MangoHacks, which runs from March 4 – 6, taps into FIU’s strong ecosystem of social innovation and entrepreneurship. The student-led effort is just the latest example of how FIU students collaborate to solve complex problems and it’s why Ashoka U recently selected FIU as a member of its prestigious Changemaker Campus network. Hackathons in particular have become more popular lately as an avenue for uniting students of different backgrounds, mentors and entrepreneurs for what’s essentially a three-day, round the clock, coding and building marathon. According to Major League Hacking, which The New York Times hails as the NCAA of college hacks, more than 150 of these events are held annually in North America and Europe. The longest-running hackathon, which dates back to 2009, accommodates 1,200 students and others have been known to draw as many as 2,500 applicants for just 500 spots. MangoHacks and its 250 participants will take over FIU’s Tech Station, an 8,000-square-foot facility designed for students in the School of Computing and Information Sciences. The $3 million facility is well-suited for a hackathon with smaller team rooms, and larger brainstorming rooms where students can roll their chairs together to collaborate with one another. At MangoHacks, students have the option of choosing from among the event’s three flavors – specific tracks that help guide the participants depending on their interests – to create anything they want. One track is designed for those new to coding; another for those interested in creating entrepreneurial programs; and another focused on social innovation. Major League Hacking and other sponsors are providing the bulk of the technology students can use. Participants need only bring their own laptops and a sleeping bag – coding and creating for 36-hours straight can take a lot out of you. The results, however, can be inspiring. At previous hackathons in the state of Florida, students developed an app that helped the homeless find local shelters and showed them ways to get there at no cost. Alvarado and a team of students also developed a fun app that analyzes the images in music videos and comes up with lyrics based on what it sees. Don’t expect any of those creations to make a repeat appearance. Students work on entirely new projects at each hackathon. On Sunday, March 6, judges will review the entries and crown a winner. MangoHacks is sponsored by FIU’s Student Government, the School of Computing and Information Sciences, State Farm, soylent, Major League Hacking, ACM FIU, and Upsilon Pi Epsilon. Do you have an interest in working on solving a problem in the world? Have you already started working on a solution? Or know someone who has? Share your story with Global Learning.